It’s not often that I have a wine that flat-out stuns me. Most of the wines I taste are very good, and many of them are great, but relatively few make me step back, take a second or third sip, and stand there in awe of the juice in the glass. The Hirsch Riesling 2007 from the Heiligenstein vineyard, in Austria’s Kamptal DAC, did just that: It made me stand up a bit straighter, shake my head a few times, and go back for a re-assessment of what I had just experienced. It was just that great. In The Ultimate Austrian Wine Guide 2008/2009, Peter Moser notes that Hirsch’s “Riesling from the desert sandstone in the heart of the Heiligenstein vineyard…excel[s] with exceptional fruit and mineral character.” I experienced that, too, as well as a gorgeous petrol perfume that was accompanied by smoky notes swirling around aromas of summertime stone fruit. On the palate, concentrated, clean, perfectly defined flavors of apricot, peach, nectarine, and what can only be called ‘mineral sweetness’ led to a lingering, stony finish. I’m often asked what wines I would include in my hypothetical desert-island case, and I always try to avoid providing specific names and vintages. Too much, after all, depends on what I’ve enjoyed lately. But this one is a no-brainer: If I could drink the Hirsch 2007 Riesling Heiligenstein for the rest of my days, I’d be a happy man indeed. Earlier this month in Austria, during Wine Summit 2009, I had the chance to speak with Johannes Hirsch during a fantastic tasting that focused on “The Diversity of Danube Terroirs,” held at the breathtaking Stift Gottweig in Kremstal. Take a look at the video below to hear what he has to say about his wines. Great Stuff Brian. Modern winemaking has made it such that most wines are good, very good and occasionally great. But those WOW wines are why we do what we do! I'll keep an eye out for this one! 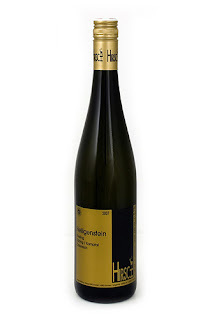 Your opening paragraph is great, as is this entire post about the outstanding Hirsch Riesling 2007. The interview with Johannes Hirsch is also a nice addition. I think nearly every attendee at the Stift Gottweig tasting would agree that this Riesling was one of the night's winning wines. I regret not having purchased a bottle of it from the Loisium or elsewhere to take back home, but I did just find it through an e-commerce site, so maybe I'll purchase it soon!